This lovingly renovated country house is situated just outside the small hamlet of Dolcedo-Lecchiore in a truly beautiful and secluded spot. The village of Dolcedo, with its restaurants and shopping facilities, is close by and can be reached either by walking a 2.5km footpath along the river or a 15 minute car ride. The beaches of Imperia are only 12km away. A small road, in parts left as gravel, connects the house to the village square. Leaving the car at the bottom of this road, one then crosses a bridge to enter the 1,830 sq.m. grounds. The private access to a river with its washed out rock pools, perfect for a refreshing swim on a hot summer’s day, makes this property a haven of privacy and tranquility. 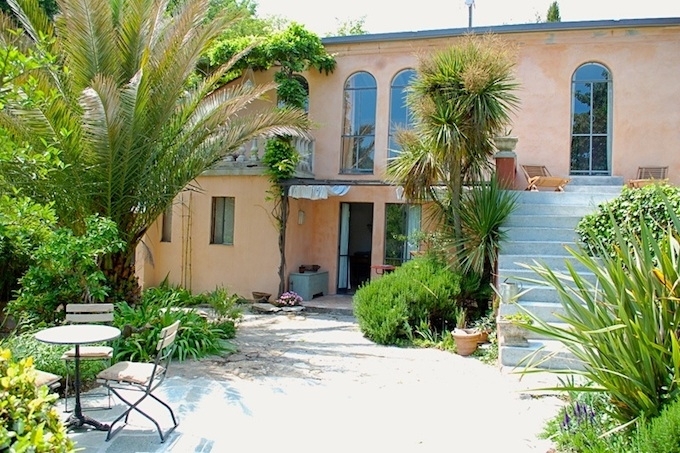 Surrounded by a beautiful Mediterranean garden with pizza oven, barbeque and fireplace, the main house takes up the right hand side of the garden. Split over two levels, it offers 80 sq.m. of living space, opening directly into the spacious living area/open-plan kitchen with access to the terrace and the garden. Adjacent are the comfortable lounge with open fireplace and a bathroom. A curved stone staircase leads up to the first floor where there is a bedroom with balcony and another interconnected bedroom with access to the garden. To the left of the main house is a smaller 30 sq.m. building, currently used as a guest house. It offers an attractive living/bedroom, a shower room and a small kitchen with access to the terrace and garden. The guesthouse is arranged over one floor level. The property is in very good condition and ready to move into. Both houses have wood fired ovens and the main house has an open fireplace.